I am sure this forum is filled with this sentiment, but let me rant, it make me feel better. I have a BS in Physics, and am studying for the November PGRE. I have taken two practice tests and got a 460 and a 500. I have yet to review my Physics 1000 course material, and I think I can do better after studying that a bit. But, in thinking about it, I am really pissed that this test exists. I enjoy the ideas in physics quite a bit, but these tests really sap the fun out it. We have a problem in the US, not enough kids are choosing science and math for a career, and I think the PGRE, or rather, the culture that thinks up and uses "standardized" tests like the PGRE has a lot to do with that. Phyiscs should be about curiosity and the scientific method --deep thinking. It should not be about quick thinking. I will grant you that these problems are fun and cool, but there are just way too many of them and not enough time to think about them. Perhaps I am a slow thinker, but who gives a rats arse how long it takes me to figure out a problem in the real world. I have been working in the field of condensed matter for the past year, and I can tell you, I have never once had to solve a problem in 1.7 minutes. I had the same problem in high school, being placed in the dumb math class because I could not do 100 multiplication problems in 60 minutes or whatever. That is because I would get fascinated by the idea of 4 groups of 12 apples, or is it 12 groups of 4 apples, or maybe it is 4 inches on one side and 12 inches on another? What really does multiplication mean? No one asks this question, just do the problems as fast as possible. Then, when algebra was introduced, suddenly I was jumped to the advanced math course. If we get rid of standardized testing, I think we'll see a lot more folks going into math and science. Anyone going into math and science knows there are going to be these incredibly stressful periods of tests, and if you dont do well you get made to feel stupid and may not be able to advance your career. No one likes feeling stupid, so most folks just avoid the whole thing. Yet our society is in desperate need of advanced technology to continue to thrive. We need everyone to help, rather than making them jump through these unrealistic, unnecessary, and emotionally draining hoops. Instead of the standardized test, we should give high-school and undergraduate students much more support in doing their own research. Then, those who are successful in research, can move onto the upper levels --a free market of research. The problem is the cost of research, but if we put the same effort into thinking of simple and inexpensive research projects, as we do into thinking of 100 simple PGRE problems, then maybe we would have better physicists. These test just bug me so much. Why do they put a time limit? Simple. Because the test designers are not good enough to come up with any other way of moving the gaussian distribution down toward the bottom. If there was no time limit, we would all do pretty well, so they put a time limit on it, and then they can claim to have a difficult test that "weeds out" the dummies. When in fact, all it does is give you a selection of folks who are either obsessed with the test, or just simply automatons who have never had an independent creative thought in their lives but have perfected the method of process identification and regurgitation. If anyone has read this far I appreciate it. I just needed to rant and posting the thoughts to a public forum gives me the slight relief that maybe my objections have been heard by someone important, and maybe, just maybe, one more brick has removed from the perverse barrier wall that is the PGRE. And maybe this post will be one more step in a direction towards a culture that encourages anyone able to do creative science, rather than discouraging and demeaning those who are not able to jump through rather inapplicable hoops. Eddy Current wrote: if we put the same effort into thinking of simple and inexpensive research projects, as we do into thinking of 100 simple PGRE problems, then maybe we would have better physicists. I bet if we hired MacGyver we could probably get a lot of cheap experiments going. He probably could have built CERN with nothing more than some garden hose, a refrigerator magnet and a broken plastic spork. I disagree that standardized testing limits the amount of students we see in science and math. True, science is about being creative and designing a way to solve problems through experiments. I think your beef is more with the education system rather than the testing. Why do we spend all our time in classes if we could just do research? Would that be a better way to develop scientific skills? All academic programs require you maintain some type of letter grade in your classes to receive a degree. Although the PGRE does not measure the "research side" of graduate school, it helps gauge if the person has the ability to get through the classes and qualifying exams. Although these classes and qualifying exams don't measure how well you will do in research, they are still required by every school. Therefore, I would assume application committees are not only looking for someone who can do productive research, but will also be able to handle the course load beforehand. A school does not want to invest money in a student who will spend two years and not get through these exams. If there were no qualifying requirements in graduate school, I doubt they would look at the PGRE scores as much, but since that is the way things are, they do. Plus, look at it this way... If two people are equal within every aspect except one has a much better PGRE score, why not take the higher PGRE score? It is just another way to limit number of applicants, even though overall, all the applicants are probably capable. And to add a bit to what WhoNonstop said, if standardized testing was scaring people away from the sciences then, by similar reasoning, we would expect even fewer people to go into law or medicine where the LSAT and MCAT are a more important aspect of the acceptance process. When I took the October PGRE, there was 1 room dedicated to all of the subject GRE test takers and about 15 rooms for the LSAT. I hope you aren't suggesting that LoLCat syled MacGyver jokes are indicative of social awkwardness. Good points, thanks for the reply. As I rant, I know that were I to be in the elite 990 club, I would extolling the virtues of the test. Like I said, the problems are fun, I just wish I were able to do more of them faster. I am coming at this from a research point of view, were I to look at the PGRE as a hoop for future professors, then yes, it has a lot more validity. You dont want your professor spending all class period deciding how to set-up his problem, they do need to think on their feet pretty well. another way to say it, I'll look stupid 100 times, if it enables me to make bank. I'll not risk looking stupid even once, if it enables me to learn something. Learning is rarely worth the embarrassment. Anyhow, cool forum. I have all the practice tests and we'll see how I do. Since I am going into research, hopefully my crap score wont hurt me too much. I can put all my effort into a killer SOG.. which I am pretty good at. It is going to have to be best SOG in the world can overcome these miserable test scores. In all honesty though, a low PGRE won't kill everything. Of course you probably won't get accepted to top schools because of it, but that doesn't mean you're worthless. The biggest part about graduate school is not where you are at, but what you put into the research. There are plenty mediocre to below average schools that are doing interesting research. As long as wherever you go, you do productive research and work hard, you'll be fine. Plus, the pgre doesnt only test quick physics thinking. It also tests diligence and perseverance in preperation. If a person who is a "deeper/slower thinker," were to practice/memorize and spend months increasing speed and test taking skills, they are likely to be just as valuable to a grad school because these are key aspects required in a student researcher. Im sure grad schools like this test, not just for testing mad fisic skilz, but also to see which students really want the spot more. They know not every one is a quick thinker. But, the admins hope that those who arent, make up for it in the time and effort they put in. At least, this is my way of rationalizing all the extra hours i put in trying to keep up with those fast thinkers. ryan6 wrote: Plus, the pgre doesnt only test quick physics thinking. It also tests diligence and perseverance in preperation. If a person who is a "deeper/slower thinker," were to practice/memorize and spend months increasing speed and test taking skills, they are likely to be just as valuable to a grad school because these are key aspects required in a student researcher. on a side note, I was pretty sure that it was in fact "madd fizics skillz" but I've since confirmed that Strunk & White specifically call out "mad fisic skilz" as the proper composition. Well done. WhoaNonstop wrote: In all honesty though, a low PGRE won't kill everything. Of course you probably won't get accepted to top schools because of it, but that doesn't mean you're worthless. The biggest part about graduate school is not where you are at, but what you put into the research. There are plenty mediocre to below average schools that are doing interesting research. As long as wherever you go, you do productive research and work hard, you'll be fine. True, I am actually not even trying to get accepted to a "top school", just a local school that is doing interesting research. Maybe I am taking the PGRE too seriously. 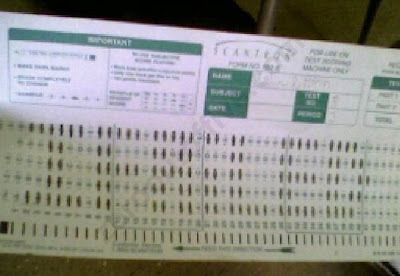 I am just so tired of these standardized tests, they have been a major stumbling block for me for so long. Hopefully this will be the last GD multiple choice test I will see in my life. One thing about mediocre schools that is interesting, the teaching is usually sooooo much better at the top schools, and this forms a positive feedback loop. If you can get into a top school, the teaching will be better, and you can probably understand the concepts better, and do better on the PGRE, and continue to get into top schools. I aced a few of my undergraduate courses by watching the MIT open course-ware videos, and then going to class and acing the tests. If I had just had access to my professors at my mediocre school, it would have been a disaster. The MIT courses were amazing in their ability to explain these concepts with succinct clarity. Having spoken to Griffiths about the PGRE, I'm convinced that OP is right and the PGRE is a complete joke. He mentioned how a student who got a perfect score on the test was interviewed by writers of the test and asked how they did so well. The answer was that they just memorized silly tricks and shortcuts to solving problems, to which the PGRE writers were ecstatic about because that was their intent for the test. However, it is important since schools will judge you harshly if you don't do well on it. Also, I did pretty crappy on my PGRE so I'm not going to lie about my opinion being slightly biased. ultraballer2000 wrote: Having spoken to Griffiths about the PGRE, I'm convinced that OP is right and the PGRE is a complete joke. He mentioned how a student who got a perfect score on the test was interviewed by writers of the test and asked how they did so well. The answer was that they just memorized silly tricks and shortcuts to solving problems, to which the PGRE writers were ecstatic about because that was their intent for the test. It's true that you can implement problem solving tricks to the test and that potentially you could ace the test without using a single bit of physics. With that said, I don't think this is a reasonable objection simply because I'm sure that very few people actually pull this off to the extent you're talking about. Yes, but the test writers intended on it to be solved by those tricks--the PGRE is based on knowing how to do these tricks. That's what my objection is primarily founded on: if a test is purely made to see how well you can NOT apply your knowledge of a particular subject, it is inherently stupid. ultraballer2000 wrote: Yes, but the test writers intended on it to be solved by those tricks--the PGRE is based on knowing how to do these tricks. I don't think you can conclude, and I would argue that it isn't true, that a test which expects you to implore tricks necessarily implies that you are not applying your knowledge of the subject. Most of the tricks you ever use on GRE problems require you to know, at least, the fundamental mechanisms by which the phenomena occurs. Solving for time dilation or length contraction can be solved quickly ONLY IF you recall how they are related to the Lorentz factor and how the Lorentz factor relates to the speed of light. Solving for values in an RLC circuit is very straightforward ONLY IF you recall the relationship between capacitors, inductors and resistors whether they be in series or parallel. Finding the Russel-Saunders term symbol for an atom is ridiculously easy ONLY IF you recall the correct progression of energy levels from Atomic Orbital theory. So far I have found very few problems on the practice tests or on the October exam that I took which can be solved without appealing to some piece of physics knowledge. so this begs the question, do you understand a concept if you remember a process with which to get a correct answer? It reminds me of Modern Physics class. I was able to ace the special relativity test by just remembering to contract length if a certain phrase was used, etc. I cant remember those tricks right now, because it was several years ago and I didn't like that method of acing a test anyhow. My goal was to understand special relativity, and I would still say that I dont understand it. I know length contracts and time slows down as you reach the speed of light, but what the really means I have no idea. I certainly dont have a working model of relativity in my head that I can call up when I want. I was talking with some other students in EM about actually understanding concepts, and they had an interesting take. I asked them how they envision the electric and magnetic fields, and they responded, "envision?, what do you mean?" "you know, what sort of mental picture do you conjure up?" "ummm, I just work the equations"
I wonder how many students dont really bother to build mental models of these ideas. If I had a better memory, I could certainly just remember the mathematical rules as to how all this stuff works, would that then mean I understand it? So, to bring this back to the original topic, when I am sitting there at the PGRE, I am trying to conjure up mental images of warped spacetime and curled fields. Maybe this is my problem, maybe I should just memorize a list of tricks and try not to think about it.... reminds me of that multiplication test I failed in fourth grade. Eddy Current wrote: "you know, what sort of mental picture do you conjure up?" That is why they need to have a drawing section for the PGRE! Eddy Current wrote: so this begs the question, do you understand a concept if you remember a process with which to get a correct answer? I would argue that precisely what the test aims to do is to test your conceptual and qualitative understanding of physics as opposed to your number crunching abilities. Most of the tricks used on the test, or at least all of the ones I've ever used, make use of arguments and process of elimination by appeals to how I know a system functions conceptually. Once you know the qualitative hows and whys, the quantitative process is just a matter of plug-n-chug. In fact, I think recognizing when time slows or length contracts and with respect to which reference frame is precisely what graduate programs want to be sure you have memorized. I also maintain that even with clever trickery, if you aren't readily familiar with the topics then you aren't getting 100 of these done in 3 hours. WhoaNonstop wrote: That is why they need to have a drawing section for the PGRE! Wait, so that whole paper with circles on it wasn't for connect the dots? Dammit! negru wrote: Wait, so that whole paper with circles on it wasn't for connect the dots? Dammit! I thought that the whole paper with circles on it was for connecting dots too. Damn, now I got it why I got low score on my SAT tests. I think the PGRE is a stupid test because it doesn't really provide any indicator of how you will do in graduate school....and isn't that the whole point of it? I mean a large majority of the questions simply test whether you know a certain formula or not, or if you read some random fact about particles or something similar. To me, this is an absolutely HORRIBLE way of testing your potential in grad school. I could understand if the questions were designed to see what your thinking process is like, but it isn't like that even remotely, thanks to multiple choice questions. It rather infuriates me because I don't want my application to be judged by my PGRE score. I'm from a LAC so we don't manage to do that well, and it will hurt my application. I don't think this is right. Graduate school is supposed to be about research, right? And the PGRE relates to this...how? fandangoya wrote: I think the PGRE is a stupid test because it doesn't really provide any indicator of how you will do in graduate school....and isn't that the whole point of it? I mean a large majority of the questions simply test whether you know a certain formula or not, or if you read some random fact about particles or something similar. To me, this is an absolutely HORRIBLE way of testing your potential in grad school. I could understand if the questions were designed to see what your thinking process is like, but it isn't like that even remotely, thanks to multiple choice questions. I love all this frustration with the Physics GRE. As I have mentioned earlier, you don't get to do research unless you make it through a qualifying exam of some sort (at least at most schools). Although I know this is a very crude way to grade someone in this area, someone with a higher scores shows more perseverance in the field than someone with a lower score. Plus, you're trying go from the point that a school is going to reject you solely on your score. It is never the case. It is always the case that someone else had better potential and probably better scores. If you have research experience worth $$$ and someone else has research experience worth $$$... then chances are they will eliminate by some other criteria.